Some days seem to last forever, with more challenges and obstacles than you ever thought could be jammed into a 24 hour period. Of course, every bad day has the chance to become amazing, but it’s always going to need some help from you to become better than bad. Whether it’s going on a bike ride, eating ice cream from the tub, or sitting down with a drink, we all have our own pick-me-ups, and it’s important to have those options available. 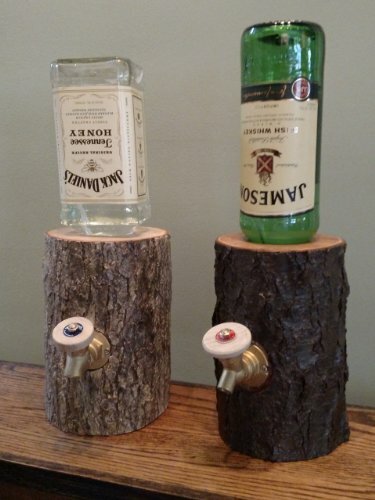 This Log Liquor Dispenser will let you pour a fresh glass of whatever your favorite libation is directly out of a log. Nick Offerman would be proud. By turning the bottle upside down, gravity will take care of making sure the booze keeps flowing until there is no more. While this can hold most 1.75 liter bottles, keep in mind that once you pour it, you’re committed to that bottle unless you want to deal with a spill. The liquor will be contained in food safe PVC, and will make contact with a brass spout on its way out. These are handmade, and every log is eight inches tall, with a 4-7” diameter. Since they are made of wood, each one weighs in at around 5 pounds, and no two of them are going to be the same. These are all harvested from Ohio hardwood trees, and are finished with a waterborn clear finish. One of these will cost you $89, and is going to look rather posh in your living room. There’s also options for wine bottles in the same price bracket!